Positions of need: The Rams altered the complexion of their entire offseason on Friday, when they sent this year’s fourth-round pick and next year’s second-round pick to the Kansas City Chiefs in exchange for shutdown cornerback Marcus Peters. Before this move, the Rams seemed very likely to draft a cornerback with the No. 23 overall pick in this year’s draft. It was that big a need. Now, as they descend on Indianapolis for this week’s combine, they have the flexibility to basically go in whichever direction they choose. They can look for edge rushers, or run stuffers for the interior, or offensive linemen to groom. Or they can keep their focus on the secondary, where plenty of holes remain. Peters enters as the Rams’ primary cornerback, but their No. 2 man, Kayvon Webster, is recovering from the ruptured Achilles tendon he suffered in December, and their slot guy, Nickell Robey-Coleman, is an unrestricted free agent. Behind them, there isn’t a whole lot of depth. Still, though, the Rams now have the benefit of targeting overall talent as opposed to specific positions. Marcus Davenport, DE, UT San Antonio: This draft isn’t necessarily strong on edge rushers, but Davenport is one of few exceptions. The question is whether he can fall to the bottom half of the first round. Davenport didn’t wow at the Senior Bowl and is still a little bit raw. But he is a quick-twitch, 6-foot-6, 255-pound athlete who is reportedly most comfortable as a stand-up rusher in a 3-4 defense. He still needs time to develop, but Wade Phillips is the perfect guy to mold him. Billy Price, G/C, Ohio State: ESPN’s Todd McShay has Price going to the Rams in each of his first two mock drafts, which might mean they find their long-term solution at center. A four-year starter for the Buckeyes, Price would be ready to play immediately. He won the Rimington Trophy as the nation’s top center and was a unanimous first-team All-American in 2017, before spending the previous three seasons excelling at guard. Listed at 6-4, 312 pounds, Price is strong, explosive and intelligent. But there are reported concerns about his personality, and the Rams could get some answers. 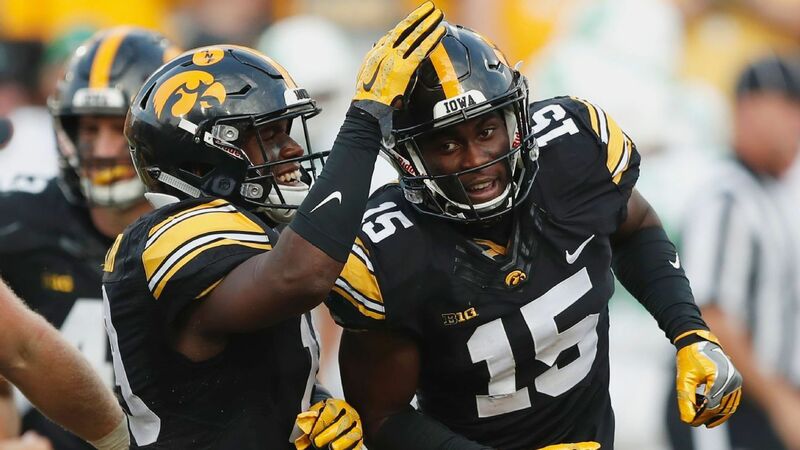 Josh Jackson, CB, Iowa: Jackson was linked to the Rams in Mel Kiper Jr.’s latest mock draft. Jackson finally got a chance to start for the Hawkeyes in 2017 and made a name for himself, leading the nation with eight interceptions and 28 disrupted dropbacks. He has everything you want in a lockdown corner — 6-1 with length, great ball skills and a strong work ethic. But he has had only one season as a full-time defensive player. Teams like the Rams need a closer look.